The view were perfect, I love it, and would like to stay at the same hotel. it was a clean hotel and safety. I don't have complaint about. The hotel was so close to everything. The staff were more than helpful with directions. The breakfast buffet was varied and bountiful. There was a problem with our a/c and it was dealt with immediately. The rooms could do with some upgrading but it was suitable for our needs, coming equipped with a fridge and microwave. The sofa bed was very uncomfortable and the boys ended up putting the mattress on the floor. All said and done, very good value for money. With a 24 hour gym and long pool access hours, my 9 and 11 year were happy to entertain themselves after spending hot days at the theme parks. The breakfast buffet alone was worth it. So central to everything. The carpet could do with some cleaning in the room. The sofa bed needed updating. This hotel is a converted AmeriSuites with a fantastic upgraded lobby. The hotel staff is friendly and accommodating. This hotel is definitely under rated as a 2 star hotel and should be a 3 star. A 42 inch flat screen television compliments each room. Beautiful guest kitchen for late night snacks next to Starbucks counter in lobby. Perfect. I really didn't like checking out. Originally owned by AmeriSuites this hotel is now under the ownership of Hyatt Place. Its ideal location has made it a popular choice for travelers excited to check out the attractions at Universal Studios. In fact, this hotel can provide a shuttle service to Universal and SeaWorld. It is also a short drive away from the magical world of Walt Disney World. Guests who stay at Hyatt Place Orlando/Universal have enjoyed the amenities, guestrooms and service they received. Visitors can relax in front of a 42 flat panel TV or enjoy a lovely sleep atop the signature Hyatt Grand Bed. Rooms can also come with a sofa sleeper for persons needing a bit more space. You can stay in touch with your family, friends or the office with the complimentary high-speed WiFi Internet access. Although the hotel is near a number of great sites you could relax on the sun deck by the outdoor heated pool. The onsite fitness center is also well equipped allowing you to still get that workout in. Guests can enjoy a free continental breakfast or they can place an order and buy a hot breakfast entrée. Made to order entrées also available for purchase include sandwiches, pizza, soups and salads. 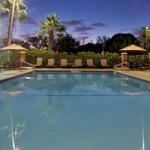 The Hyatt Park Orlando/Universal received many positive reviews. Guests were impressed with the available amenities considering the price they paid. Plus, its location made it ideal for touring the area. The complimentary breakfast helped travelers save even more and having the option for a hot breakfast, even if for a fee, was appreciated. Parking: Yes, there is parking. The parking is complimentary.